If you have been paying attention to the latest beauty trends, you may have noticed the rapidly growing popularity of activated charcoal teeth whitening. 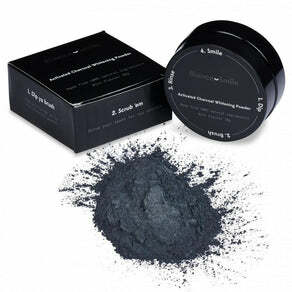 To sceptics, it may seem counterintuitive to brush your white teeth with black powder; however, activated charcoal has actually been a method of teeth whitening for a long time dating back hundreds of years. Let’s take a closer look and discover how this ancient method of teeth whitening works and why so many people are choosing it to whiten their teeth. Before you go and make yourself some ordinary charcoal to brush your teeth with, it is probably a good idea to know what it is first. Ordinary charcoal has been an ancient natural ingredient for centuries, but its effective properties can be further enhanced by achieving its activated status. This is produced when the charcoal is exposed to high temperatures and gases which expands its surface area allowing it to effectively bind to toxins and making it one of the most absorbent substances in the world. Activated charcoal is very safe and has actually been used as a medical poison treatment for centuries. In fact, it is recognised by the World Health Organisation (WHO) as one of the most essential medicines due to it being easily accessible, inexpensive and safe. As for your teeth, it is probably safer than your toothpaste as it is all natural with no chemicals and it is also very safe to digest. Activated charcoal acts as a detoxifier due to its ability to bind to and absorb toxins which effectively removes odours and plaque compared to your regular toothpaste. Many people are also shifting to activated charcoal because it is a natural way to remove stains without the use of bleach or other chemicals that can be harmful for your teeth. If you are looking for a stronger alternative to your toothpaste then give Bianco Smiles activated charcoal powder a shot, you will be surprised how much brighter your smile can get. The only drawback of activated charcoal is that it is effective only for the external surface stains of your teeth and you will need a stronger whitening agent if you want to whiten the internal stains. The Bianco Smile teeth whitening kit offers a safe and effective way to do so by breaking through your enamel and removing those stains without the risk of damaging the enamel. This would be the perfect product if you have heavy stained teeth and you can also use activated charcoal to maintain the whiteness afterwards.